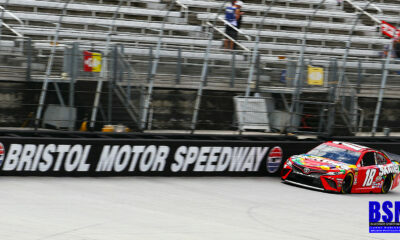 NASCAR returns to Bristol for the annual Spring race. 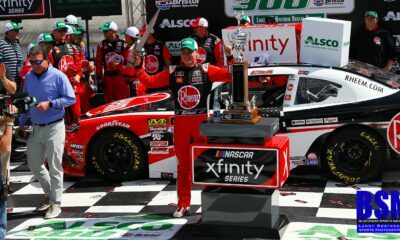 The Xfinity Series of NASCAR was held today at the Bristol Speedway in Bristol, Tennessee. Bluegrass Sports Nation was there in attendance to cover the race. 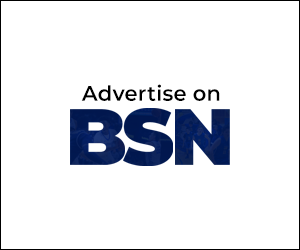 Bluegrass Sports Nation continues to strive to cover all sports and provide the public with excellence in sports coverage. The race was attended by 2 members of the Bluegrass Sports Nation Coverage team. Larry Robinson and myself David Leveridge were both in attendance covering the race. Kyle Larson #42 won the poll for the race and was the leader for the first 168 out of 300 laps. Larson had a top speed of 127.98 MPH with a lap time of 14.992 seconds. Rain was a deterring factor and delayed the race with a red flag at approximately 2:20 pm. The delay would last until 3:40 pm. Crews tried several times to dry up the track and were actually pulling out of pit row twice when a pop up shower delayed the race, requiring the track to be dried again. There were several cautions that delayed the race and several wrecks occurring that involved multiple cars. The first wreck happened on lap 81 involving the #38 car driven by Ryan Reed who drove the Lilly Diabetes Ford. The wreck caused a caution that lasted from lap 81 to lap 95. Reed crashed into the wall and lost a tire, his car was fixed by crew members and soon returned to racing. The next caution happened on lap 121 as Ray Black the second lost control on turn #2. Black was driving the Scuba Life Chevrolet. The Caution flag was held until lap 129. Black was involved in another accident on lap 221 as he got tangled up with the #99 car driven by David Starr, both drivers were trying to pass each other and advance into a better field position. Black’s and Starr’s car were both finished from racing and had to be towed back to the pit. Black finished 37 out of 40 and Starr finished directly in front of him @36. The worst Single crash happened on lap 245, Brendon Guaghan was passing on the high side of the track, lost control and hit the wall while detaching the front right tire from the car. The race was held with no drivers on the track until the car was towed and oil was cleaned up from the track. Gaughan was driving the #62 car a Chevrolet Camaro sponsored by South Point Hotel and Casino. Once the car was removed from the track, ground crews again had to dry up the track and the race was ran on caution until lap 259. On lap 262 two cars were involved in a crash on turn # 4, heading into the home stretch. David Custer#00 and # 6 Darrell Wallace Jr, collided with both hitting the wall. Both cars were now to damaged to finish the race with both being towed back to the pit. 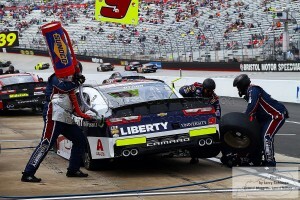 The drivers were held on a red flag that lasted five minutes and ten seconds, with a caution from lap 262 to 266. On lap 271 Ross Chastain lost control and forced another caution. Chastain was driving the # 4 car a GK Services Chevrolet Camaro. The caution lasted from laps 271 to 277. The final caution of the race occurred within the last ten laps of the race as the drivers were trying to advance in the race standings. The last crash was the worst accident of the day that involved multiple drivers on turn 4. Justin Allgair driving the #7 car a Chevrolet Camaro sponsored by Cheney Brothers/ Southern Foods collided viciously with William Byron. Byron was driving the #9 car another Chevrolet Camaro sponsored by Liberty University. Both drivers were going low trying to pass and they clip each other on the rear end, one car lost control and soon followed the other, Both cars hit the wall and was towed back to pit row. Although the accident was severe, the caution was only held 4 laps from laps 293 to 297. The race featured 15 lead changes and was lead by seven drivers. Kyle Larson lead the majority of the race leading 180 laps. Larson would lead the race at 5 different times during the race. Ryan Blaney was next he led 61 laps. Blaney lead at 4 different times during the race. Eric Jones who would go on to win the race lead 27 laps at 2 different times during the race. Daniel Suarez lead 18 laps at 2 different times during the event. Daniel Hemric led 8 laps with only leading one time during the race. #33 Brandon Jones led 5 laps while leading only 1 time during the race. Austin Dillion led one lap of the race. Erik Jones would take the lead late in the race and didn’t look back. Eric Jones would go onto win the race, driving the #20 car a Toyota Camry sponsored by Reser’s American Classic. Race Sponsor Fitzgerald Glider Kits had a strong car that finished second. Ryan Blaney finished in second place driving a ford mustang. Daniel Suarez finished in third place. Suarez was driving the #18 car another Toyota Camry sponsored Juniper Health. Elliot Sadler finished in fourth place driving the Armor 150 years Chevrolet Camaro. The top ten was finished out by #21 Hemric, #3 Dillon, #42 Larson, # 48 Poole, #11 Koch, and #5 Annet. Toyota had a very strong showing at today’s event with cars finishing in first and third. 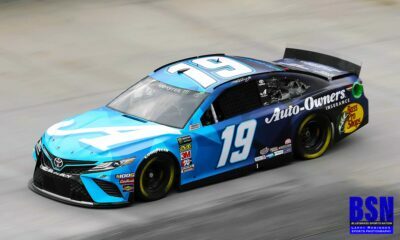 Ford had one car finish in the top 10 at # 2. Chevrolet finished out the top 10 with 6 cars, that finished fourth to tenth place. 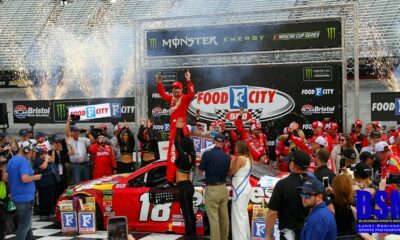 Sunday at Bristol!!! Monster Energy Cup Photo Gallery! !